Produktinformationen "ALLNET ALL0136-4-GB-TX / PCIe 1000M Quad Cooper Server-Card"
The new ALL0136-4-GB-TX Network Adapter builds on ALLNET history of excellence. 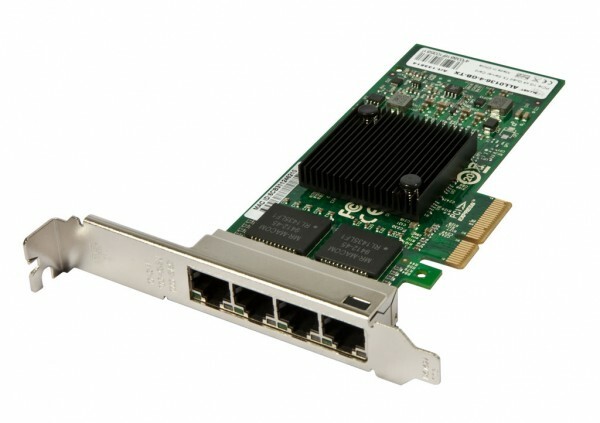 ALLNET continues its market leadership with this new generation of PCIe- GbE network adapters.Built with the bridgeless Intel Ethernet Controller I350, these network adapter represent the next step in the Gigabit Ethernet (GbE) networking evolution for the enterprise and data center by introducing new levels of performance through industry-leading enhancements for both virtualized and iSCSI Unified Networking environments.This new family of adapters also includes new power management technologies such as Energy Efficient Ethernet (EEE) and DMA Coalescing (DMAC). The ALL0136-4-GB-TX network adapter includes Intel Virtualization Technology for connectivity (Intel VT-c) to deliver I/O virtualization and Quality of Service (QoS) features designed directly into the controller on the adapter.I/O virtualization advances network connectivity models used in todays servers to more efficient models by providing Flexible Port Partitioning (FPP),multiple Rx/Tx queues, and on- controller QoS functionality that can be used in both virtual and non-virtual server deployments. By taking advantage of the PCI-SIG SR-IOV specification,the adapter enable Flexible Port Partitioning (FPP). With FPP,virtual controllers can be used by the Linux- host directly and/or assigned to virtual machines.With this port partitioning,administrators can create up to eight dedicated connections on a single Ethernet port for use in baremetal and virtualized server deployments. ALL0136-4-GB-TX network adapter with native iSCSI initiators built into Microsoft- Windows-, Linux-,and VMware- ESX platforms provides a simple,dependable, cost-effective way to connect to iSCSI SANs.These native initiators are broadly tested using multiple generations of operating systems,storage systems,and OS tools to help ensure reliability and ease of use.Standardizing on ALLNET Ethernet Adapters for iSCSI enables administrators to use a single initiator,TCP/IP stack, and a common set of management tools and IT policies.In addition, ALLNET Ethernet Server Adapters include a number of hardware features designed to accelerate iSCSI traffic and enhance data processing. For example, TCP segmentation offload and checksum offload capabilities help reduce processor usage, increase throughput, and deliver exceptional iSCSI performance. Finally, using native OS initiators, an ALL0136-4-GB-TX network adapter supports the CRC-32 digest instruction set included with Intel Xeon processor products,which improves transmission reliability and delivers an enterprise-class iSCSI solution. Today,companies everywhere are looking for ways to decrease energy consumption across the enterprise to reduce costs and environmental impact, while at the same time solving increasingly important power density challenges. Thats why ALLNET has introduced new, advanced Power Management Technologies (PMTs)with the ALL0136-4-GB-TX network adapter that enable enterprises to configure power options on the adapter and more effectively manage their power consumption. The ALL0136-4-GB-TX network adapter supports the IEEE802.3az Energy Efficient Ethernet (EEE) standard so that, during periods of low network activity, EEE reduces the power consumption of an Ethernet connection by negotiating with a compliant EEE switch port to transition to a low power idle (LPI) state.This reduces the controller power to approximately 50% of its normal operating power, saving power on the network port and the switch port. As oon as increased network traffic is detected, the controller and the switch quickly come back to full power to handle the increased network traffic. EEE is supported for both 1000BASE-T and100BASE-TX. ALLNET include new teaming technologies and techniques such as Virtual Machine Load-Balancing (VMLB) for Hyper-V environments. Today, ALLNET includes a variety of teaming configurations for up to eight adapters, support for mixed vendors server adapters teaming and includes support for 802.1q VLANs, making ALLNET one of the most capable and comprehensive tools for supporting server adapter teaming. Additionally, Intel PROSet for Windows- Device Manager and PROset CL extends driver functionality to provide additional reliability and Quality of Service features and configuration. Weiterführende Links zu "ALLNET ALL0136-4-GB-TX / PCIe 1000M Quad Cooper Server-Card"